A cherry amber coloured Bakelite / Catalin desk stand incorporating a pair of brick effect inkwells along with a butterscotch amber coloured Art Deco Bakelite perpetual desk calendar. Stand 28cm wide, 11.5cm deep, 9cm high (inkwells). Total weight of both pieces 1,072 grams. Royal Crown Derby Judge Gary service. 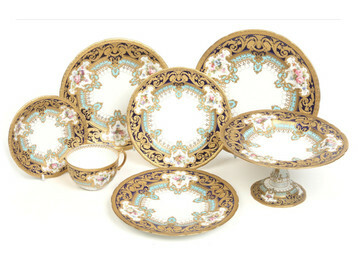 Six lots from the Royal Crown Derby Judge E. H. Gary service commissioned by Tiffany & Co. New York. A rare and fine Royal Crown Derby dessert comport from the Judge Elbert Henry Gary service. Painted by Albert Gregory with panels of flowers framed within elaborately moulded gilt borders incorporating a G. monogram by George Darlington on gros bleu and turquoise grounds. Signed by both artists, printed mark in gilt with Royal Warrant and Tiffany & Co retailers stamp, date code for 1911, 22.25cm wide, 12cm high. Notes; Only two comports were ever made for this service, the other comport sold through these rooms on 1st September 2018 lot 215. A 19th century French amboyna marble top side cabinet in the manner of Henry Dasson. With gilt metal mounts and a rectangular plaque to the frieze depicting putti allegorical of science. With fluted ionic columns, mirrored back and raised on toupie feet, 1m 20cm wide, 1m 29.5cm high, 41.5cm deep. A boxed fine Royal Crown Derby dessert plate by Desire Leroy from a service for Judge Elbert Henry Gary. With a wide raised gilt border and six alternating panels finely painted with flowers. Signed, printed mark in puce with Royal Warrant and Tiffany & Co retailers stamp, date code for 1902, 22.75cm wide. Seven Years' War; ten 18th century brass overcoat buttons. Each with a painted ivory miniature forming a tableau of General James Wolfe on the plains of Abraham at Quebec in 1759, including equestrian and maritime scenes. One button shows the death of General Wolfe after the painting by Benjamin West 1771. Each 36mm diameter (10). Charles Edward Dixon (1872-1934) gilt framed watercolour. Above Woolwich 1901. H. M. S. Dunvegan Castle and other vessels in a harbour scene. Signed, 27cm x 76cm. Frame 60cm x 105cm overall. A 19th century Chinese carved hardwood scholar's table screen. With open fret carving and raised on lion dog supports. Set with a silk needlework panel depicting a landscape with birds, trees and peonies, 73.75cm high. Embroidered panel, 42.5cm x 35cm. A 19th century Chinese square baluster vase with moulded twin mask handles. Painted in underglaze blue with landscapes and figures with rockwork and pine trees, 38.5cm high. A ladies Rolex Oyster Perpetual Datejust stainless steel bi metal bracelet watch. With diamond and ruby set bezel, satin gilt dial, having centre seconds and magnified date display. With screw down crown and case back, cal. 2030. With box and papers, 26mm wide. A fine and rare Royal Crown Derby twin handled bouillon cup and saucer from the Judge E. H. Gary service. Painted by Albert Gregory with panels of flowers framed within elaborately moulded gilt borders by George Darlington on gros bleu and turquoise grounds. Signed by both artists, printed marks in gilt, date codes for 1910, with Royal Warrants and retailers stamp for Tiffany & Co. Mark, saucer 13.5cm diameter. A Russian silver equestrian themed Kovsch. With reeded borders, the handle formed as horses head and with cabochon amethysts. Punch marks to the underside, 284 grams, 14cm. An 18th century French kingwood and tulip wood parquetry side table by Charles Topino. With gilt metal mounts and raised on square scrolling supports. With fitted single drawer and a sliding top section revealing a spring loaded button for a secret side compartment. Stamped C. Topino, c.1760, 70cm high, 43.5cm wide, 33cm deep. A 19th century Chinese wucai glazed gu shaped vase. The rim edged in brown enamel and decorated beneath with precious objects between underglaze blue bands. Honorific Ming Dynasty Chenghua period reign mark in underglaze blue, 24cm. A very rare Caughley tablespoon. Printed to the bowl with a version of the Full Nanking pattern and to the handle with the Fitzhugh pattern c.1785, 21cm. Provenance; Exhibited in the Caughley Bicentenary Exhibition 1999, label to the reverse of the bowl. A large George V mahogany longcase clock with glazed trunk. With gilt arch top dial signed Edward Ewen, Dumfries. Having silvered chapter ring with applied Arabic numeral markers, with subsidiary seconds and subsidiaries for strike / silent and chime selector. Housing an 8 day three train movement striking on seven gongs with Westminster, Whittington and St Michael chimes, 2m 25cm high. An Art Deco platinum and diamond three stone ring. With a square cut diamond flanked by a pair of baguettes c.1950, approximately 0.7ct total, size N.
Filippo Grispini (19th century society painter), large gilt framed oil on canvas. Portrait of a lady wearing a white dress adorned with purple ribbons and seated beside a pair of pigeons. Label for Foord & Dickinson framers. Signed verso and dated London 1874, 126cm x 101cm. Alfred Pollentine (1836-1890) gilt framed oil on canvas. Santa Maria dell Salute, Venice. Signed and inscribed verso, dated 1861, 40cm x 60cm. A 19th century French rosewood sleigh bed upholstered in deep buttoned and damascened gold silk. Banded in satinwood and with ormolu mounts. With a single bowed side and raised on scroll supports, 2m 23cm x 1m 47cm. A Victorian elm and oak single drawer plank top refectory table. Raised on reeded square supports with cross stretchers, 2m 53cm x 89cm, 72cm high. Height to skirt 60cm. A vintage Shell enamel advertising sign. A vintage Shell enamel advertising sign. Yellow ground, 'We sell Shell lubricating oils, every drop tells! ", 91cm x 61cm. A boxed fine Royal Crown Derby dessert plate from the Judge Elbert Henry Gary service. Painted by Albert Gregory with panels of flowers framed within elaborately moulded gilt borders incorporating a G. monogram by George Darlington on gros bleu and turquoise grounds. Signed by both artists, printed mark in gilt with Royal Warrant and Tiffany & Co retailers stamp, date code for 1915, 23cm wide. A late 19th century French large bronze figural mystery clock. The orb shaped timepiece having Roman numeral markers is held aloft by a maiden dressed in a flowing robe, wearing a wreath of roses and raised on a circular plinth. Housing an 8 day cylinder movement striking on a bell, 162cm high. A Chinese transitional period wucai sleeve vase. Painted with groups of figures in a continuing landscape amidst red smoke scrolls. With a band of chrysanthemums to the collar and rockwork around the base. Unglazed base, 32.25cm high. A 19th century Chippendale style mahogany serpentine twin pedestal desk with panelled sides. Having leather top, carved gadrooned mouldings and raised on ogee bracket feet, 146cm wide, 96cm deep, 75cm high. Kneehole 59cm high. A fine Royal Crown Derby dessert plate from the Judge E. H. Gary service. Painted by Albert Gregory with panels of flowers framed within elaborately moulded gilt borders incorporating a G. monogram by George Darlington on gros bleu and turquoise grounds. Signed by both artists, printed mark in gilt with Royal Warrant, Tiffany & Co. stamp, gilt footrim and impressed Derby, date code for 1909, 20.75cm wide. A yellow metal and diamond bar brooch supporting a diamond set garland and with a central cluster of rose cut stones, 52mm wide. A Regency mahogany centre pedestal table with marble top. Raised on a plain spreading column over a triform base supported on carved paw feet, 81cm diameter, 74cm high. A fine Royal Crown Derby entree plate from the Judge Elbert Henry Gary service. Painted by Albert Gregory with panels of flowers framed within elaborately moulded gilt borders incorporating a G. monogram by George Darlington on gros bleu and turquoise grounds. Signed by both artists, printed mark in gilt with Royal Warrant and Tiffany & Co retailers stamp, date code for 1909, impressed Derby, 20.25cm wide. A pair of George V 9 carat gold and enamel cufflinks. Decorated with four scenes representing four vices, Assayed Birmingham 1923. A pair of George I walnut hall chairs of pegged construction. Inlaid with boxwood, ivory and ebony to depict stylized flowers issuing from a baluster vase and with further diamond patterned border. Raised on plain cabriole supports and with turned cross stretchers, 94cm high, seats 44cm high, 54cm wide. A pair of Regency mahogany leather upholstered library chairs. With concave backrests and raised on turned supports. A Spode dog bowl printed in underglaze blue with the Jumping Boy pattern. Printed and impressed marks c.1820, 21.5cm wide. Franz Xaver Wolf (Austrian 1896-1989), gilt framed oil on panel. Library interior with a Cardinal seated by a desk reading with a globe and books by his side, 48cm x 37cm. 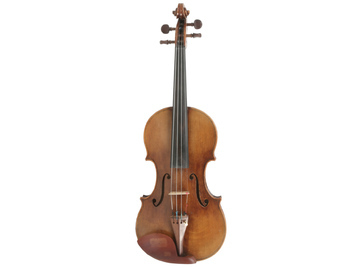 A violin in modern soft case. Label for Pietro Messori, Modena, weight 498 grams, 35.5cm. A 19th century Chinese square baluster vase with twin mask handles moulded below the shoulders. Painted in coloured enamels, the front and the rear depict a two storey pagoda with noble figures and attendants housed within, the sides with figures in a garden landscape, 39cm. A Georgian figured walnut and oyster veneered bureau. Crossbanded, with fitted interior, oak lined drawers and raised on bracket feet, 84.5cm wide, 51cm deep, 1m 5cm high. A rare Worcester sucrier and cover with flower moulded finial. Painted in the atelier of James Giles with flower bouquets and scattered sprigs under gilt line borders c,1765, 11cm high. A 19th century bow front serving table. A 19th century bow front serving table. With concealed drawer to the frieze and raised on reeded square tapering supports, 183cm wide, 66cm deep, 85cm high. A 19th century Chinese rouleau vase. Decorated in famille vert enamels with a continuing landscape depicting a lady and gent on horseback with attendants with willow trees and brooding clouds under a diaper border and a further river landscape scene, 45cm. An antique diamond solitaire ring. Set with an old mine cut stone approximately 1ct. Probably platinum, size P.
A Chinese Republic period bowl with scalloped rim. With red key fret borders, incised on a blue ground with lotus scrolls and scattered with enamelled sprigs, finely painted within circular reserves with birds and flowers. Yongzheng four character seal mark printed to the base, 27cm diameter. A Chippendale style mahogany camel back upholstered three seat settee. With reeded acanthus cresting rail with shell motif, having blind fret carving and raised on carved paw feet c.1900-20, 2m 16cm wide. A George II mahogany bachelors chest. Incorporating a brushing slide and with four graduated drawers raised on ogee bracket feet, 76cm wide, 46.5cm deep, 77cm high. A taxidermy male snipe in parcel gilt case by Peter Spicer & Sons, Leamington. Stood amidst reeds and grasses with his head tilted back. Signed to one pebble, case 41cm high. A gentleman's Rolex Oyster Royal manual stainless steel wristwatch. With satin dial having applied gilt markers on a chapter ring and with centre seconds, serial; 806378 reference; 6144. Crown stamped Rolex Super Oyster, 30mm wide. A Brameld bucket shaped breakfast cup with figure 7 handle commissioned by the Dundee & Hull Steam Packet Company. Printed in sage green to depict the Forfarshire Steamer and with the hop pattern border, c.1834 7.5cm. Notes; On 5th September 1838 Forfarshire left Hull, bound for Dundee. At 4 o' clock the following day the ship ran aground. All but 9 perished who were rescued by Grace Darling and her father; the lighthouse keeper, in what became the most romantic sea rescue of the Victorian era. The condition of this example leads us to believe that the cup was recovered from the wreckage of the ship, cf. Rockingham 1745-1842, Alwyn & Angela Cox p. 170-71.